​Climate change can impact our mental health and emotional well-being, from the way we feel about our altered home environments to how our brains are affected by increased heat and wildfire smoke. Yet changes to our climate also provide an opportunity to re-think our lifestyles and our communities in ways that promote resilience, personal growth, and well-being. To learn more about climate and mental health, click on the buttons above, or simply scroll down. How Does Climate Change Affect Mental Health? Poor mental health often goes hand in hand with poor physical health, financial strain, and worry about the future - all of which may stem from climate change. More erratic and extreme weather patterns can lead to a wide range of mental and emotional health problems, including stress, anxiety, depression, violence, and suicide. 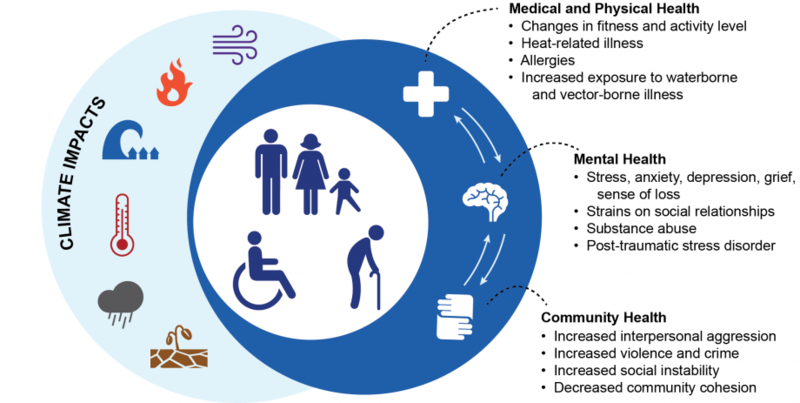 The diagram at right, created by the U.S. Centers for Disease Control, shows the many ways climate change affects human health, both physically and mentally. While the physical dangers of a rapidly shifting climate are well-known, mental impacts are often overlooked. As we strive to adapt and grow, it's important to consider both. Read on for examples of how our changing climate can impact our mental and emotional well-being. Extreme heat​ raises our brains' levels of cortisol, the so-called "stress hormone," leading to potential increases in irritability, aggression, violence, anxiety, and suicide. High temperatures also limit physical activity and time spent outdoors, both of which are important coping mechanisms for some. Certain medications used to treat mental illness impair the body’s ability to regulate temperature, creating further risk for those with existing mental health problems. Extreme weather events, including wildfires, can force people from their homes and forever change the landscapes to which we are connected. Such events may lead to: chronic stress, including post-traumatic stress disorder (PTSD), as well as depression, anxiety, substance abuse, suicidal thoughts, and increases in domestic violence. Fine particulate matter present in wildfire smoke also causes brain inflammation, the effects of which are not yet clear. Drought​ greatly disrupts the lives of farmers, ranchers, and the communities in which they live. Increased rates of worry, chronic stress, domestic violence, substance abuse, and suicide have been found among communities affected by prolonged drought. Forced migration due to wildfires, drought, famine, coastal flooding, and hurricanes can devastate or destroy entire communities. Climate changed-induced disasters are expected to displace more than 200 million people worldwide by 2050, leading to potential conflicts over resources wherever climate refugees resettle. Solastalgia is a word coined to describe feelings of sadness, anxiety, grief, and helplessness due to changes in our cherished environments. As we watch beetle infestations decimate forests, wildfires alter landscapes, and droughts change our watersheds and our wild and agricultural lands, such feelings of distress may become more common. The threat of climate change itself can be a stressor for some. Increasing awareness and media coverage of the affects of climate change can lead to feelings of anxiety, stress, hopelessness, despair, loss of control, sadness, grief, and guilt. Anyone can suffer from mental and emotional health problems, which strike regardless of background, especially in times of crisis or strife. ​However, some circumstances can put particular groups at greater risk. Children are naturally resilient, but they also are particularly susceptible to distress and anxiety over traumatic events and climate-induced upheavals. Chronic stress can put children at risk of mental health issues later in life. Existing risk factors and protective factors play a role as well. Women, pregnant women, and postpartum mothers. Women are more likely to experience post-traumatic stress disorder (PTSD), mental health problems, and feelings of vulnerability or anxiety after climate-related disasters. Impacts to their mental health often affect the health of their children. The effects of climate change also can increase levels of domestic violence against women. Seniors typically have higher rates of untreated depression, more physical ailments, and a greater likelihood of social isolation. All of these factors can increase their susceptibility to the negative mental health impacts of climate change. Native Americans are more likely to struggle with climate change on a number of fronts. High rates of poverty put indigenous peoples at greater risk during extreme weather events, and historical trauma can make additional, climate-induced traumas more difficult to bear. The alteration of culturally and spiritually significant environments also can lead to grief, despair, and depression. Those with prior or existing mental health struggles or trauma may experience worsened symptoms in the face of climate change. In addition, many medications used to treat mental health disorders interfere with the body's ability to regulate heat, leading to increased potential for heat stroke and hyperthermia. People who are poor are less likely to have the resources to cope with climate change. They may not have access to health care, and they may be unable to take measures to make their homes cooler or safer during extreme events. Those who are homeless also lack protection from the elements, including heat and wildfire smoke. All of these factors increase susceptibility to anxiety, worry, chronic stress, and depression. ​Those with heart and lung ailments and other disabilities. Climate change is bringing increased wildfire smoke, hotter days, and a longer allergy season. All of these can affect people with asthma, cardiovascular problems, and even allergies, causing them to feel fearful, worried, stressed, isolated, and irritable. Immigrants and refugees, in particular refugees from drought, sea-level rise, and hurricanes like New Orleans' Katrina, face the loss of loved ones, difficult financial circumstances, strained relationships with their new communities, and trouble adjusting to a new home. Such obstacles may lead to depression, anxiety, sadness, hopelessness, and domestic violence. On the other hand, when everyone feels generally happy, safe, and cared for, those feelings can have a positive impact on community well-being. In spite of its negative consequences, climate change presents a unique opportunity to promote growth and well-being above and beyond current levels. 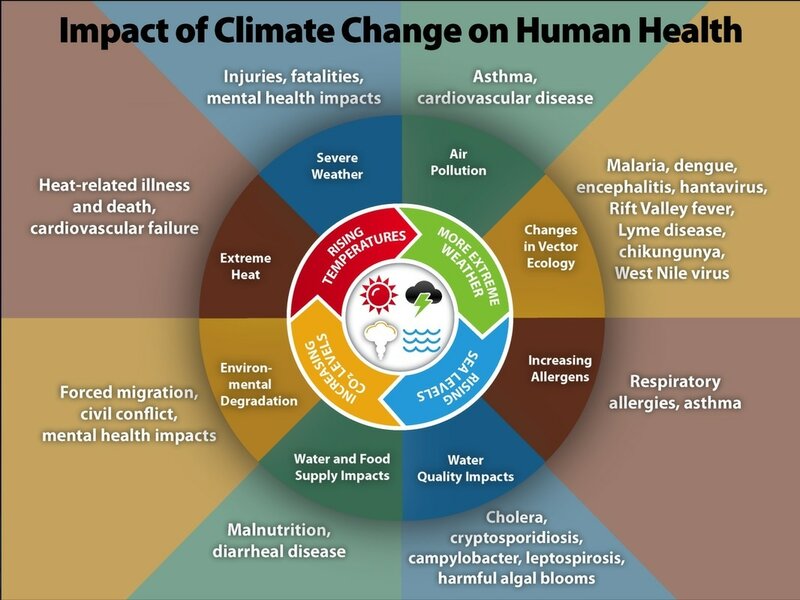 Rather than attempting to get "back to" pre-climate change levels of community health (which actually weren't very healthy for many of us) the threat of climate change provides an opportunity to adapt in ways that increase health, happiness, and resiliency for everyone. Allowing us to address the inequities that make marginalized groups more vulnerable to climate-related health impacts. 1. Focus on personal relationships. Spend time with the people you love. Reach out to neighbors you don’t know well. Engage with people who are different than you and listen to what they have to say. And don't forget your furry friends! The more socially connected we are, the better we all feel. 2. Buy less stuff. Reducing our consumption not only decreases fossil fuel use, it also helps us focus more on the things that matter most to us. For people who are able to meet their basic needs, reducing additional consumption can increase happiness and well-being. 3. Grow our urban forests. Plant trees and support tree-planting and care throughout our community. Studies show that greener neighborhoods decrease crime and violence, reduce stress, improve cognitive function, and increase feelings of well-being. For more info, check out our Shade page. 4. Identify a time when you overcame adversity to learn, grow, or find new meaning in your life. Revisit that situation in your mind when you’re struggling or feeling down, and remember you can apply these lessons to increase personal and community well-being in the face of climate change. 5. Exercise (for those who are able). You don’t have to climb mountains or run. Even a 10-minute stroll can have positive effects. Physical activity releases chemicals in the brain that make us feel better. And don't forget to bring your pets! 6. Spend time outdoors (as long as it's not dangerously smoky). Visit your neighborhood park, work in a garden, or sit under a nearby tree. Research shows that small doses of nature close to home have a significant positive impact on our emotional well-being. 7. Talk about mental health to reduce the stigma around depression, anxiety disorders, and other mental health problems. 8. Adapt to increased heat, drought, and wildfire smoke. Check out these resources to learn how: Hotter Days and Warmer Nights, Drought and Low Flows, Wildfire Smoke. 9. Envision new ways to promote happiness. Nations around the world are reconsidering economic growth as a primary goal. One alternative is to promote happiness and social well-being as the primary indicators of a healthy society. 10. Get involved! Engagement with issues that matter to us helps promote feelings of efficacy, empowerment, connectedness, and pride. Help build more vibrant, carbon-neutral communities. Volunteer for a nonprofit or faith-based organization that helps those in need. Call state and federal legislators. Make your home more energy efficient. For more ideas, check out Climate Smart Missoula’s Advocacy Page. ​Explore the U.S. Global Change Research Center's findings on Mental Health and Well-Being. The American Psychological Association has a comprehensive guide to Mental Health and Our Changing Climate. Discover the Mental Benefits of Urban Forests. Read a psychologist's take on the importance of allowing ourselves to grieve as we cope with changes to our Earth. The University of Montana's own Roslyn LaPier discusses the impacts of climate change on Native American spiritual practices. Mental Health Effects of Climate Change provides an overview of this topic. 2015. This 2011 article explores Sustainable Consumption, Energy Policy, and Individual Well-Being. This 2016 paper addresses how cities' adaptations to climate change often exacerbate existing social inequalities.